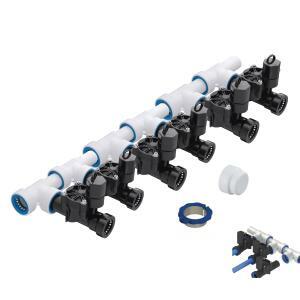 This 6 Zone PVC-Lock Sprinkler Manifold Kit, using the latest developments in irrigation technology, is the easiest to assemble manifold kit currently on the market. Does not require the use of toxic glues and primers, simply push and go. PVC-Lock works in wet and dry conditions, even under water, with instant pressurization. Fittings rotate 360° after installation, for easy alignment.